Britain's IBF world heavyweight champion Anthony Joshua will not fight former champion Wladimir Klistchko in 2016 but promoter Eddie Hearn expects a fight in the spring. 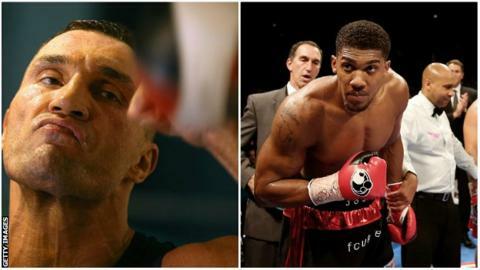 The pair were close to agreeing a bout for 10 December but Klitschko has picked up a "minor injury" in training. "While waiting on the WBA and with Klitschko's injury, it was a non-starter," said Hearn. "Let's get this over the line for March or April." Hearn has reiterated that Joshua will compete in Manchester on 10 December but expects an official announcement on a 2017 meeting with Ukrainian Klitschko later this week. He added: "We will announce that fight for the spring and give it the build-up it deserves - probably take it to a stadium as well. I'm certain it will happen in the spring. "We are in talks with the Millennium Stadium [now the Principality Stadium] about their dates in March and April - it has a roof and it can be a bit nippy in London in March or April." British heavyweight Tyson Fury has vacated the WBA and WBO titles and had his boxing licence stripped by the British Boxing Board of Control "pending further investigation into anti-doping and medical issues". Hearn is hopeful the WBA will make its title available for the proposed meeting of Joshua and Klitschko. New Zealander Joseph Parker is set to fight Mexico's Andy Ruiz Jr for the WBO belt on 10 December. Joshua picked up the IBF title - vacated by Fury as he did not face a mandatory challenger - by knocking out Charles Martin in April. Hearn expects Joshua's camp to decide on his next opponent in the next 48 hours. Last week, 2008 Olympic bronze medallist and former British champion David Price tweeted Joshua stating "I'm coming to knock you out on December 10".